This outfit was inspired by recent outfit pieces posted by two other bloggers. First off, I got the idea to hitch up a little bit of the dress to add some interest to the outfit from Sheila. 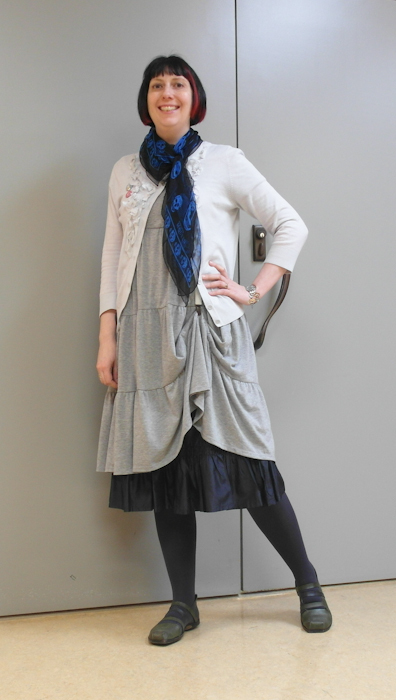 She used brooches to gather up her skirt. I used on of those clips with elastic between them (I don't know what they're called. I kind of like how it turned out. The second element is my Cydwoq shoes. Megan Mae has been wearing some Cydwoq flats which reminded me how much I like these shoes. They are almost architectural with their angles and strappy leather. These aren't totally comfortable though because there's a zipper on the back of the shoes that cuts into the back of my achilles tendon so I keep it unzipped about a centimeter. 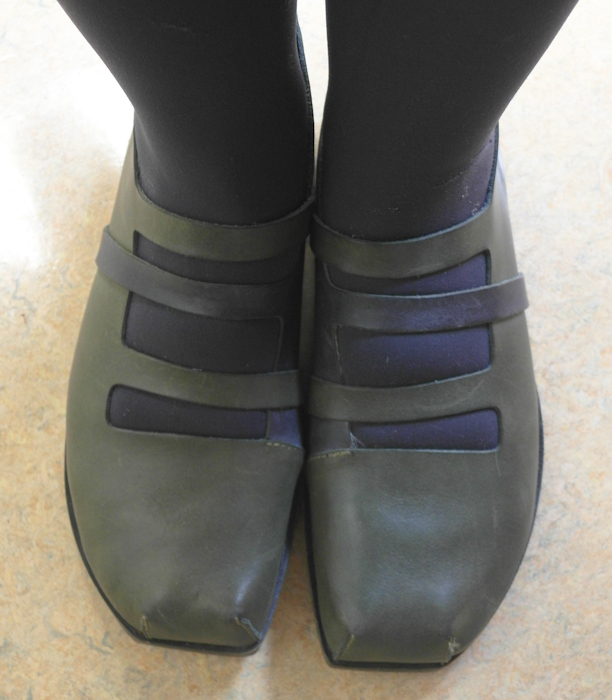 The heel of these shoes is a bit lower than the toe, kind of like Earth shoes "negative heel technology". These are prettier though. I added some flair. These are my favourites. 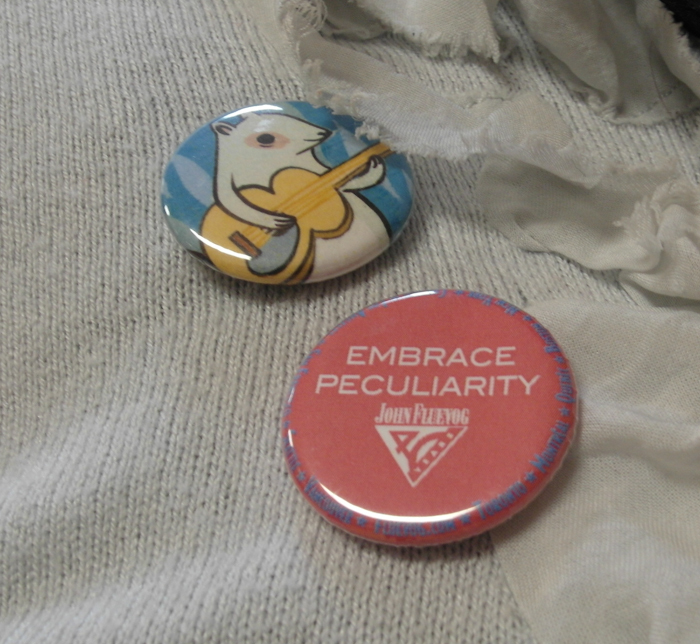 Who doesn't like guitar playing squirrels and embracing their peculiarity? Ooh! You're also channeling Audi a bit with the McQueen necklace. It all comes together so well. I love the Cydwoqs! Sorry to hear the zipper causes issue. They're awfully cute. I am in love with the squared toe on cydwoqs. I always love your pins. They're so cute. I love how you hoisted that sail! You definitely added interest! Cool shoes yet again, my friend! It's a dress clip - we wore them on the backs of our oversized dresses in the 90s. :) I love how you hitched it up! So cute! The Cydwoqs look fab, but I hate the heel-lower-than-the-front thing. There was a really cute pair in my size on sale for $125 but I couldn't take them - they felt so weird. I love my Cydwoqs with the little 2" heel, though. Great outfit, Megan - I really love your style. Oh my that gathering of the skirt is a really good idea! I love how the skirt is gathered! It's really pretty! I'm loving your flare even more, I adore that squirrel pin, he is too cute!